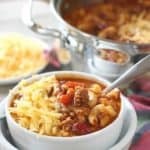 An easy 30 minute hearty soup where even the uncooked macaroni is tossed in the pot! Add olive oil to large soup pot or dutch oven. Add ground beef and cook until done. Stirring and breaking up meat with a spoon. Cook for 3-4 minutes until onions soften. Add tomato paste, beans, diced tomatoes and bring to a simmer. Add cumin and chili powder, stir. Continue to cook for an additional 8-10 minutes until macaroni is tender. Serve with grated cheese on top!